C:\Documents and Settings\Owner\Desktop\SmitfraudFix moved successfully. C:\Documents and Settings\Owner\My Documents\Dylan's Business\setup.exe moved successfully. C:\WINDOWS\Downloaded Program Files\otdcyqkv.exe moved successfully. C:\Program Files\America Online 9.0\cdegfr moved successfully. C:\Program Files\America Online 9.0\wdcevf moved successfully. 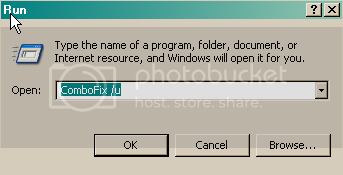 Please open Hijackthis and choose "do a system scan only"
Then click on Fix Checked and then Close Hijackthis. Please then delete all other tools if any that I had you download. Thank you so much! You are a pro at what you do....is there a physical address I can send a donation to to help you and this wonderful site continue to run??? No, nothing personal but I don't give my personal address out. You can click on my donation button in my signature or you can donate directly to the site if you wish. But both go through PayPal.